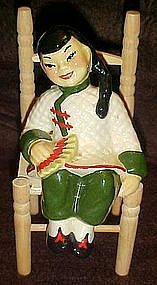 Su-Lin shelf sitter made by Ceramic Arts Studio of Madison Wisconsin. She goes with Sun-li (who I do not have at this time). She measures 5 1/2" tall and is in perfect condition. Marked with the Studio mark. Chair not included. I see that another Cyberattic dealer has the matching boy for sale.